The new trailer for the final Harry Potter installment is just out. It's dark. It's dramatic! And I can't wait!!!! Looking for something interesting and exciting to do for the end of the Easter break? 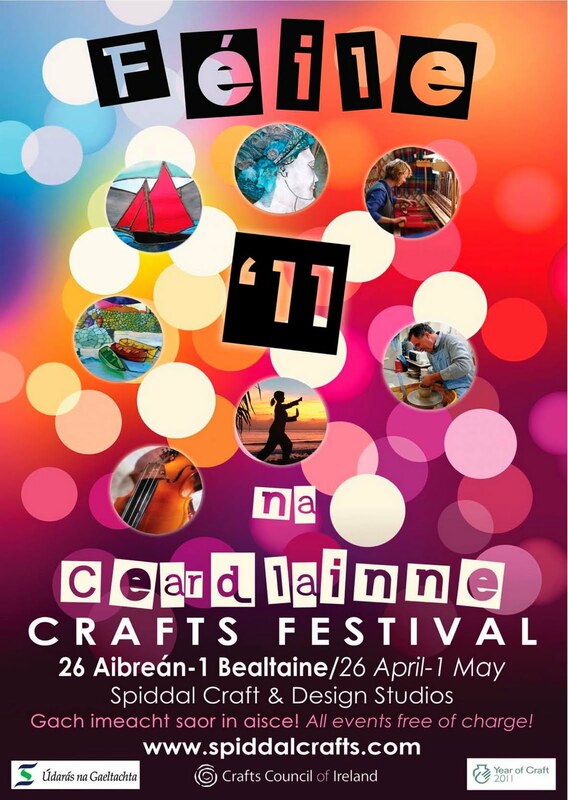 Why not take a trip up to the Spiddal Craft & Design Studios and enjoy Feile na Ceardlainne... the Crafts Festival taking place from 26th April through 1st May. A host of wonderful workshops and events, all for the enjoyment of the whole family and all free of charge!!! In this year's Writer's Week in Listowel, the festival is celebrating it's 40th anniversary. And what an amazing programme they have! This year's festival is promising to be truly special, with an amazing variety of events. Focusing on the children's events, there will be a full programme set up just for children of all ages running from Thursday the 2nd of June through to Sunday the 5th of June. It will include some of our favourite children's authors, such as Sarah Webb, Judi Curtin, Roisin Meaney, Inbali Iserles, John Boyne..... there will be a Wandering Word workshop and a Bookmaking workshop with the Happy Artist... the list is incredible! So while the adults are enjoying a huge variety of events featuring everyone from Cathy Kelly through to Richard Dawkins, John Connolly to Rita Ann Higgins (talk about variety!) the younger among us have loads to keep them interested and occupied and delighted. As I'm sure we've all heard by now, the final book in the Alex Rider series by Anthony Horowitz has been released, and it is as gripping, action-packed and adrenalin filled as the first. As Scorpia Rising opens, the international terrorist organisation, Scorpia, has reformed and is planning it's most bold and damaging attack to date, which will involve framing both the British Government and it's most famous spy since Bond... boy MI6 agent, Alex Rider. But as said, this is the book in which we bid farewell to Alex. He's grown beyond discernible childhood and to carry on simply makes him one more secret agent. Horowitz made the decision long ago that Alex Rider would end when he reached 15 years of age, and he has kept his promise in dramatic form. If you're an Alex Rider fan, this is an absolute must. If you've not read them before (where have you been? ), start with Stormbreaker and catch up. Here's a quick reminder, for all those who don't know. April 23rd is the UN designated World Book and Copyright Day. It's a symbolic day in the world of publishing and literature. April 23rd is the anniversary of the deaths of Shakespeare, Cervantes and Inca Garsilasco de la Vega, all of whom died in 1616. It is also the birth or death date of quite a number of prominent authors. How will you mark the day? I may be stepping into a hotbed of controversy here. Let me begin by saying that I'm certainly not opposed to technology (this is a blog, after all... though I am allergic to twitter), and I can see many advantages. However, the influx of e-books and i-readers, particularly when it comes to picture books and children's novels, I have some real concerns that come from an understanding of literacy development in young children. This blog entry, 'Books Without Batteries: the negative impact of technology', by Bill Henderson is from Publishers Weekly, and it addresses briefly literacy development, but the strength of it's discussion lies within the statistics of the environmental impact.... well worth a read. "Here's what an e-reader is: a battery-operated slab, about a pound, one-half inch thick, perhaps with an aluminum border, rubberized back, plastic, metal, silicon, a bit of gold, plus rare metals such as columbite-tantalite (Google it) ripped from the earth, often in war-torn Africa. To make one e-reader requires 33 pounds of minerals, plus 79 gallons of water to refine the minerals and produce the battery and printed writing. The production of other e-reading devices such as cellphones, iPads, and whatever new gizmo will pop up in the years ahead is similar. "The adverse health impacts [on the general public] from making one e-reader are estimated to be 70 times greater than those for making a single book," says the Times. "Also, I'm going to paraphrase Julia Donaldson on children's picture books on e-readers, which I think is very apt. She said that she didn't believe picture books should be presented to young children as e-readers, "just because we can." This is absolutely brilliant!!!! In response to the now famous New York Times article; 'Picture Books No Longer A Staple For Children', the NYTimes received a tube in the post containing a scrolled 15 foot letter from Birch Lane Elementary School in Davis, California. 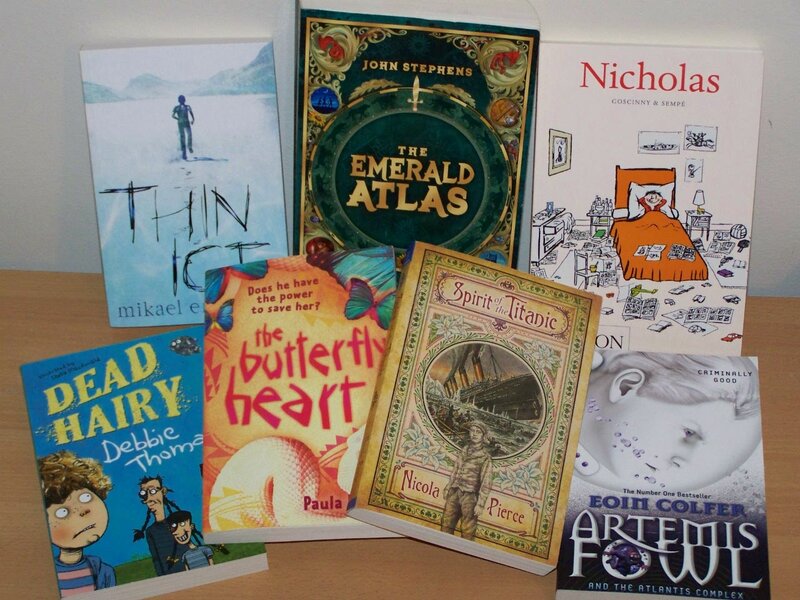 Having taken exception to the article, the school designated February as 'Love A Picture Book Month'. "We believe that picture books are essential to the development of life-long readers and learners", say the children; and each child signed the letter personally, with hand prints as well as signatures. I don't think there is anything I could add to that statement. Follow the link below to view the scroll.... you HAVE to see this!!!!! Spirit of the Titanic by Nicola Pierce: The familiar Titanic story told from a truly unique perspective. Dead Hairy by Debbie Thomas: great fun, loaded with laughs... this one is a pure delight. Thin Ice by Mikael Engstrom : A must-read for ages 11yrs. +; this story of a young boy's search for a real home, where he actually feels he belongs, and the struggle and journey to get there is told with compassion and humour. Artemis Fowl and the Atlantis Complex by Eoin Colfer : out now in paperback... in fact, the entire series to date has just been re-jacketed. If you haven't read the adventures of the young criminal master-mind, do so immediately. The Butterfly Heart by Paula Leyden : A lyrical story from Zambia, Bul-boo and Madillo are powerless to save their friend Winifred from a horrible fate, so they rely on Ifwafwa, the snake man, to help them... before it's too late. Beautiful! The Secret Kingdom by Jenny Nimmo : 'Charlie Bone' fans will love this one. Wonderful, wonderful, wonderful. Crowfield Demon by Pat Walsh : we return to the middle ages, and to Crowfield Abbey for this dramatic sequel to Crowfield Curse.... incredible historical fiction with the right touch of magical fantasy. And I can't forget Nicholas by Goscinny (who brought us Asterix) and Sempe is now back in print and in paperback... and as always, is a complete delight for all. And I have to mention... coming soon, The Emerald Atlas by John Stephens. A book like this doesn't come along very often, so keep your eyes open for it's appearance. It is one you will not want to miss. Just a few for you... enjoy! I know I've mentioned this before..... on facebook a page has been set up titled '1000 Paper Cranes for Japan'. With the ongoing crisis due to the earthquake, tsunami and the disasters ensuing at the Fukushimi nuclear power plants, quite a number of people have become involved in making origami paper cranes as a symbol of hope, peace and healing for this time of need. It is a small thing, but every crane is a prayer or a wish. And just because you're not on the facebook page, doesn't mean you shouldn't participate..... and it's a brilliant activity for the holidays if you're looking for something to do. I'm including the link for the video that shows very clearly how to make paper cranes. And I also recommend (again) that you read 'Sadako and the 1000 Paper Cranes'. Cuirt International Festival of Literature launches in Galway this evening.... which means festival season in Galway is well and truly under way. For the kids, there are a few events well worth pointing out. While school children in the local area are being treated to the Fighting Words workshops and to the wonderful Marita Conlon McKenna, there are a couple of general events on Saturday, 16th April, and since the schools are out for their Easter break early on Friday, might as well start the break off with a bang. At 12.30pm at the Nun's Island Theatre, the wonderful Clare Muireann Murphy will treat her audience to Mad Myths for the Strong Hearted. Clare is a Galway based storyteller with world-reknown. She regularly tours Europe and America, intriguing her audiences of all ages with tales from folklore and mythology. If you haven't seen Clare yet, you really should. Her shows are always fascinating, exciting and an absolute joy. Suitable for ages 8 - 12 years; admission is €8/€6. And more excitement is coming our way in September! After lo these many years, tales from the 1950's collected by an avid collector of 'Suessiana' will be published in book form late September. These include stories clipped from magazines, many of which were the precursors to his famous and well-loved children's books. 'The Bippolo Seed' is described by publisher Random House as being "the literary equivalent of buried treasure". It has been 30 years since the author of my favourite book of all times (Where The Wild Things Are) has published as an author/illustrator. But Maurice Sendak is making a return to the world where he is, undoubtedly, one of the true masters. 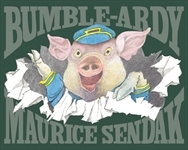 Set for publication this September, Bumble-Ardy is the tale of a young pig who, having reached nine years of age, has never had a birthday party. So, he decides to throw his own. 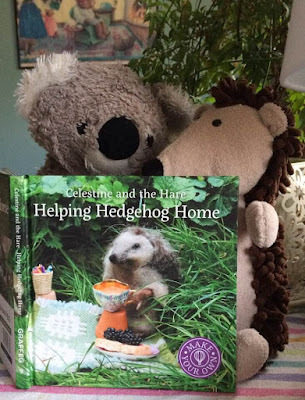 Publisher HarperCollins "promises Bumble's party will be "a wild masquerade that quickly gets out of hand", with the author once again exploring "the exuberance of young children and the unshakeable love between parent (in this case, an aunt) and child". Published on the 6th of September, personally, I can't wait! 'The Sky Is Everywhere' Coming In Paperback! By now, you've probably perceived my enthusiasm for the completely marvellous teen novel, 'The Sky Is Everywhere' by Jandy Nelson. Now, our good friends at Walker Books have announced it's release in paperback. To celebrate, this video trailer has been released. 'The Sky Is Everywhere' will be released in paperback on the 2nd June, 2011. 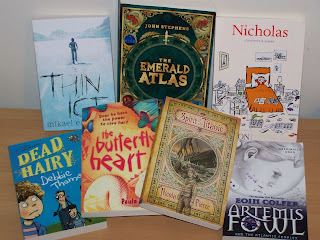 The shortlists for both the Carnegie CILIP and the Kate Greenaway Medals 2011 have been announced with some impressive titles and authors/illustrators making for a very strong competition for these prestigious awards in children's literature. Shortlisted for the Carnegie CILIP Medal are: Patrick Ness for Monsters of Men, Marcus Sedgwick for White Crow, Meg Rosoff for The Bride's Farewell, Jason Wallace for Out of Shadows, Theresa Breslin for Prisoner of the Inquisition and Geraldine McCaughrean for The Death Defying Pepper Roux. Grahame Baker-Smith for FArTHER, Anthony Browne for Me and You, Bob Graham for April Underhill, Tooth Fairy, Mimi Grey for her illustrations in Jim: a cautionary tale, Oliver Jeffers for The Heart and the Bottle, Kristin Oftedal for illustrating Carl Norac's Big Bear, Little Brother, Catherine Rayner for Ernest and, finally, Juan Wijngaard for his beautiful illustrations in Cloud Tea Monkeys. This year's Cuirt International Festival of Literature will hit the streets of Galway very shortly.. Running from 12 through 17 April, this year's festival is featuring many new faces, some who ave never been to Cuirt before, some who come with debut novels. It promises to be interesting. Among all those offering their literary talents, the children have not been entirely forgotten. For the kids we will see Marita Conlon McKenna on Thursday at the Town Hall Theatre, the Fighting Words workshop and the Schools Slam, the wonderful Claire Muireann Murphy bringing her 'Mad Myths for the strong hearted...' to Nun's Island Theatre; there's even a bookmark making workshop. Cuirt... it's not just for grown-ups, you know. The Times and Chicken House have teamed up to search for another great children's writer. As such, they have announced the Times/Chicken House Children's Fiction Competition 2012. With an impressive list of judges that includes the likes of Michelle Paver, Barry Cunningham, Nikki Gamble and others, they have out out the call for manuscripts (not more than 80,000 words) suitable for children ages 9 to 16 years. So, if you have such a manuscript on paper or in your head, here's the link that will explain all. Good luck!